These earrings are adapted from Scandinavian finds of 'Ring Pins' which were used to fasten undergarments in the period 2000 BCE - 1000 CE. Ring Pins had circular heads of the size of these, and a long delicate pin which was passed through the garment. The ring prevented the pin falling out. Amber and silver were commonly used for Norse (Viking) jewellery. Sterling Silver (925/1000) wire was twisted and then formed into the circles, and the earwires hand-forged. 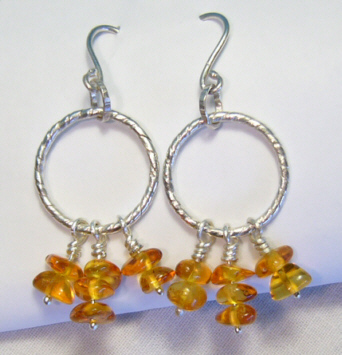 The Amber chips are attached with Fine Silver (999/1000) wire.